Early in the morning on 1 January 1991 Moana Cole, from New Zealand, Ciaron O’Reilly, from Australia, and Susan Frankel and Bill Streit, from Washington, D.C., calling themselves the ANZUS (Australia, New Zealand and U.S.) Peace Force Plowshares, entered the Griffiss Air Force Base in New York, USA. After cutting through several fences, Bill and Sue entered a deadly force area (where soldiers are authorised to shoot to kill), they hammered and poured blood on a KC-135 (a refueling plane for B-52’s) and then proceeded to hammer and pour blood on the engine of a nearby cruise missile armed B-52 bomber that could be used in the Middle East. They presented their action statement and an indictment to base security who encircled them moments later. 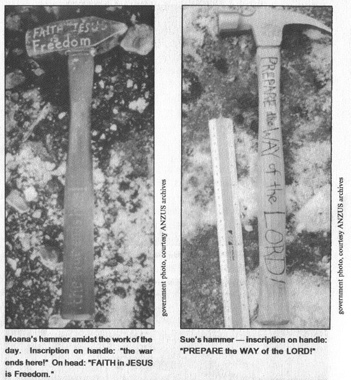 Simultaneously, Moana and Ciaron entered the base at the opposite end of the runway, and made a sign of the cross with blood on the runway, spray-painting “Love Your Enemies – Jesus Christ”, “No More Bombing of Children in Hiroshima, Vietnam, Iraq, or Anywhere!” and “Isaiah Strikes Again”. For approximately one hour they hammered upon the runway chipping at two sections, one being nearly five feet in diameter, before they were detained. A written statement the group, who were all members of the Catholic Worker movement, carried with them declared that they came together from three different countries to reclaim the acronym from the ANZUS Treaty and create a “new pact for peace, which is the way of the Lord.” They also asserted they were acting to prevent war in the Persian Gulf and called upon people to nonviolently resist war and oppression. In their indictment they cited the U.S. government for war crimes and violations of international law. All four were indicted on 9 January 1991 on federal charges of conspiracy and property destruction and faced a maximum sentence of 15 years in prison. After being held in jail for two months, they accepted pre-trial release on March 6th. They went to trial in Federal Court in Syracuse in May and were convicted by a jury. On August 20th, they were sentenced to twelve months in prison and ordered to pay $1800 in restitution. After serving 10 months Bill and Sue were released from prison in mid-June 1992. Moana and Ciaron were released in late June on bail pending a deportation hearing. In October 1992, Moana returned to New Zealand following her court-ordered voluntary deportation. Moana currently lives in Christchurch and has been completing a Masters Degree in Law focusing on the legality of the US-led occupation of Afghanistan.